Police investigate a scene the morning after an explosion in Bangkok,Thailand, Tuesday, Aug. 18, 2015. Police in Thailand arrested a suspect Saturday in connection with the bombing earlier this month that killed 20 people. The man, described as a foreigner, was being charged with possessing explosives and was in military custody, authorities told reporters. The suspect was also found with ball bearings, fuses, pipes and other bomb-making materials, as well as a stack of Turkish passports, police and army officials said. All Thai television channels carried a brief broadcast by the Thai military junta at 6 p.m. Saturday announcing the arrest. National police chief General Somyot Poompanmoung speaks to reporters outside the compound where police detained a suspect in the August 17 Bangkok shrine bombing, in a Bangkok suburb on Aug. 29, 2015. It was the first big breakthrough since the August 17 blast at the popular Erawan Hindu Shrine in central Bangkok killed 20 people — Thais, Chinese, Malaysians, a Singaporean and an Indonesian — and wounding more than 100 people of numerous nationalities. The bombing was the worst single mass casualty attack in Thailand. It was followed a day later by an explosion in the Chao Praya river adjacent to the Sathorn pier, about five kilometers away from the shrine. No one was injured in that detonation. Authorities believe a separate man on the King Taksin Bridge, around the time of the shrine blast, had dropped a time bomb into the river. The military junta’s announcement came hours after a “foreign man,” said to be 28 years of age, was taken into custody on the eastern fringe of Bangkok. 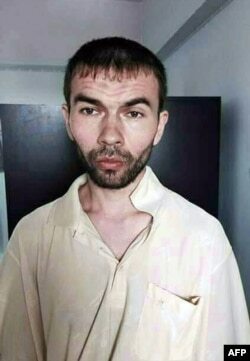 A police source said the arrest of the suspect, who is believed to be Turkish, came after investigators sifting through records of mobile phone calls identified three Turkish numbers, which had been activated by international roaming services near the blast site, according to the Sunday edition of the Bangkok Post. Earlier, authorities had told reporters that a tip from a landlord had led them to the suspect whose apartment building was surrounded by more than 100 police and soldiers on Saturday. Thai police stand on the balcony outside of an apartment building in Nong Jok on the outskirts of Bangkok, Aug. 29, 2015. 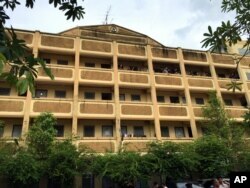 Thai police say they arrested a suspect in the blast at the Erawan Shrine in this apartment building. The bomb-making materials found at the apartment were similar to those used at the Erawan Hindu Shrine and were linked to the second explosion as well. A handout photo from the Royal Thai police and released on August 29, 2015 shows the suspect which is being detained at a police station in Bangkok. The motive by the main culprit was instead "taking personal revenge for his comrades,” asserted Police General Somyot Pumpanmuang, without elaborating on how authorities had quickly reached that conclusion. The suspect was being questioned late Saturday in the presence of officials of the Turkish Embassy, local media reported. Police released a copy of the photo page of one of the Turkish passports with the arrested man’s photo. It was quickly alleged on social media that the passport was a crude forgery with two dates of expiry and several misspellings in Turkish. A search was underway for more than 10 additional suspects, some of whom were already believed to have left the kingdom, police said, but they had been ruled out as being part of a wider international terrorist network. 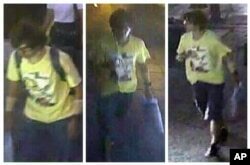 The Thai police have come under criticism for their investigation, in which they had released contradictory information about possible suspects in the bombing. The prime suspect was captured on closed circuit television — a man in a yellow T-shirt who left a bag at the shrine just before the explosion. Authorities denied to VOA that Chinese were likely the primary target. In recent days speculation had increased about a possible link to China's ethnic Uighur minority or their co-religious sympathizers in Turkey. Thailand’s military government last month forcibly repatriated more than 100 Turkey-bound Uighur refugees to China, a move condemned by international human rights groups. That led to an attack on the Thai consulate in Istanbul where windows were smashed. VOA's Ron Corben contributed to this report.